A firefighter inspects the scene of a Saturday morning collision between a motorycle and SUV in the parking lot of the Edge Fitness Center on Kings Highway Cutoff. A motorcycle slid under the front of an SUV after a collision in the parking lot of local gym Saturday, sending the biker to the hospital for treatment of "non-life-threatening injuries," firefighters said. 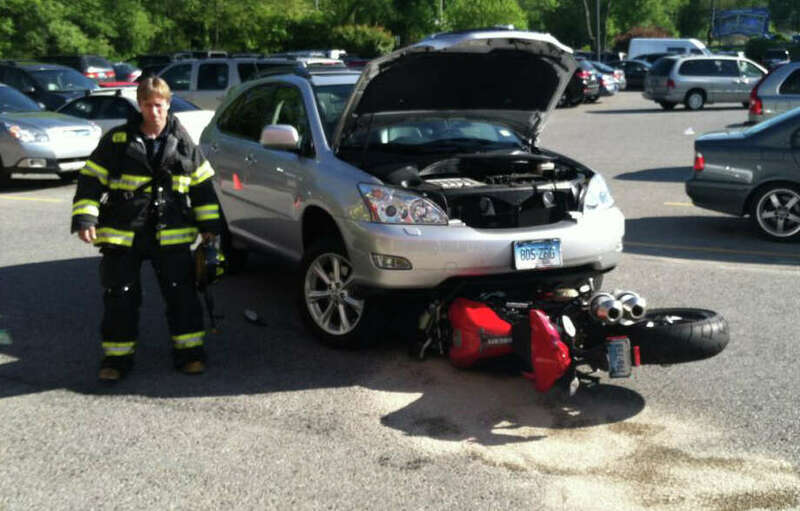 Firefighters were dispatched shortly before 8:30 a.m. Saturday to the parking lot at the Edge Fitness Center, 500 Kings Highway Cutoff, where a motorcycle and SUV collided. On arrival, firefighters found the motorcycle under the front of the SUV, injuring the motorcycle rider. Fluids from the vehicles had spilled on the parking lot surface. The motorcyclist, who was wearing a helmet, was treated at the scene for injuries that did not appear to be traumatic, firefighters said, and transported to a hospital by AMR Ambulance for further treatment. The SUV driver was unhurt and declined treatment, firefighters said. "The operator of the motorcycle was wearing a helmet at the time of the accident and it appears to have prevented more serious injuries," Assistant Fire Chief Scott Bisson said in a statement issued after the accident. The accident is being investigated by Fairfield police.